When the Player Properties window appears, click Resources on the ribbon. Click the Add button (the icon that looks like a blank piece of paper) at the bottom of the Resources window. When the Add Resource window appears, enter a Title for the resource. This is the text learners will see when they browse your list of resources. 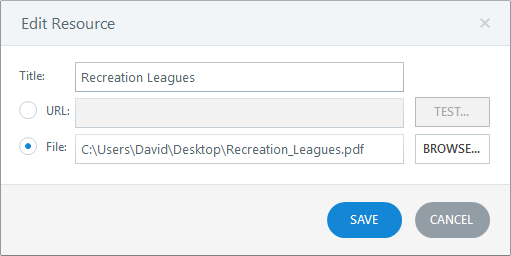 If you're adding a file, click Browse. Select the file you want to attach and click Save. 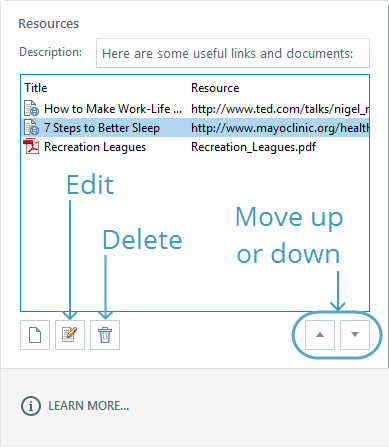 When you publish, Storyline will bundle a copy of the file along with your course. (It'll be located in the story_content folder of your published output.) Learners will need to have the appropriate software to view the file. For example, if the resource is a Word document, they'll need Microsoft Word to open it. Storyline adds the item to your resource list. There will be an icon next to the title to indicate the type of resource. 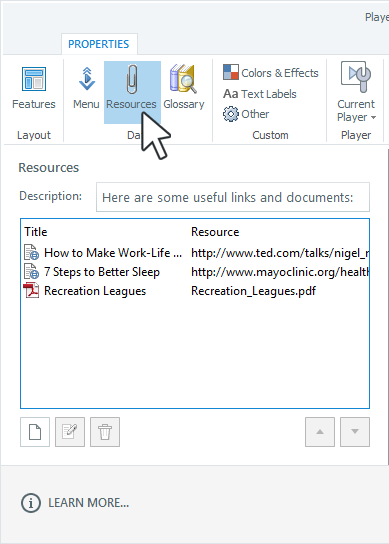 Use the buttons at the bottom of the Resources window to edit, delete, and rearrange resources. When you add resources to a course, they're saved in the project, not in the player. As a result, saving your player and applying it to another Storyline project doesn't carry over your resources. If you want to reuse the same resources in another project, we recommend saving the original project as a Storyline template. 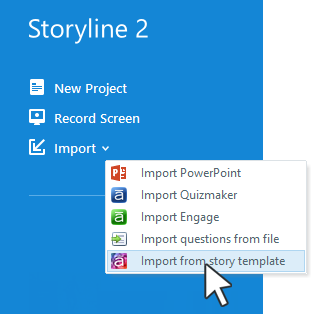 When you're ready to begin a new project, use the template as your starting point by clicking Import from story template on the Storyline launch screen. Tip: If you add, delete, or change resources in a Storyline template, those changes won't automatically carry over to existing projects based on that template. You'll need to make the same changes in existing projects manually. By default, built-in player tabs—like Resources—display for all slides in your course. If you want to hide them for certain slides, see Adjusting Slide Properties. Want to change the title of the Resources tab? Easy! The name comes from your player's text labels. If you need help editing text labels, see this tutorial.